Feel the magic of the world famous Niagara Falls on this guided, full-day sightseeing tour from Toronto in a Luxury Mercedes Sprinter or Luxury Mini Coach Bus. On the way to Niagara, you will view Welland Canal, that connects Lake Erie and Lake Ontario. Table Rock is a great stop, it is the heart of Niagara Parks - where every year millions of visitors stand close to the thundering water rushing over the brink of the Horseshoe Canadian Falls! Next, hop on the Hornblower Boat Cruise (seasonal between April - November) to get to the very edge of the roaring waters and then relax with a lunch at the Sheraton Fallsview Buffet (with lunch upgrade). After some free time to explore your own, take a scenic drive along the historic Niagara Parkway and see the fully-bloomed flowers on the Floral Clock. Visit the historic town of Niagara-on-the-Lake, where you can end the day with a lovely winery tour and free wine tasting. Toronto hotel pickup and drop-off included. Discover the breathtaking sights and sounds of the Niagara region on this small-group tour to Niagara Falls from Toronto in a Mercedes-Benz Sprinter or a Luxury Mini Coach. This highly rated 9-hour day trip will showcase all the points of interest on the Canadian side of Niagara Falls. 1.5 hours of scenic drive to the falls from Toronto. Upon arrival in Niagara Falls, experience the power of the Falls from Table Rock and feel like you are right on the top of the Falls at the waters edge. Walk along the Table Rock and feel thundering natural phenomena of The Falls. Experience all three famous waterfalls is from the famous Hornblower Niagara Cruise (formerly known as the Maid of the Mist). 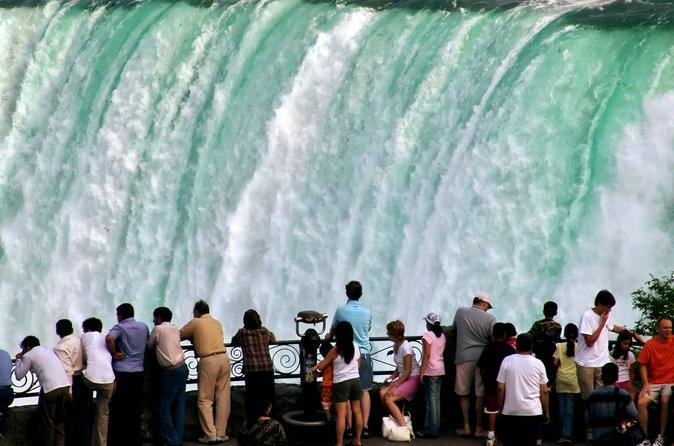 Get up close and personal with the magic of the mighty Niagara Falls–a memory that will last a lifetime. Enjoy a delicious buffet lunch at the Penthouse Sheraton Fallsview Restaurant (with lunch upgrade) that offers not only a delicious variety of meals but also the best view of the Horseshoe Falls. After lunch, you'll have leisure time to explore your own at Niagara Falls, Clifton Hill by the Falls, other attractions, souvenir shops and restaurants within walking distance from the Falls. Later afternoon, as you drive along the Niagara Parkway, you will understand why former British Prime Minister Sir Winston Churchill described this route as "the prettiest Sunday afternoon drive in the world"
Stop at the Hydro power stations and Brock's Monument in Queenston Heights. You’ll have the perfect photo-op at the Floral Clock and at the ‘world’s smallest chapel’ before complementary visit to one Canada’s Award Winning wineries for the tasting of the ever famous ‘Ice Wine’ and two other wines (and the option of grape juice tasting). The day tour ends with a return trip to Toronto and a hotel drop-off.